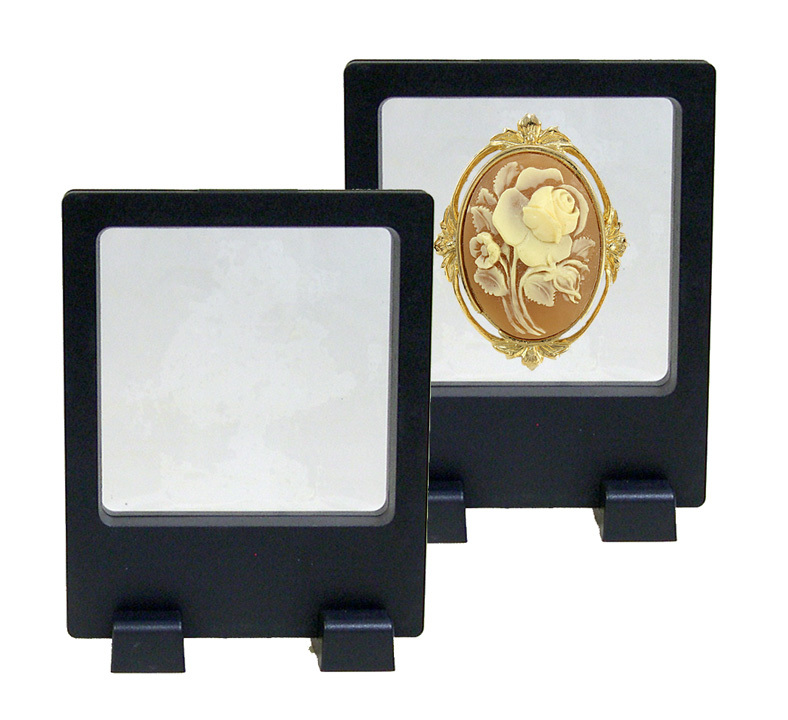 These attractive DISPLAY FRAMES are Black Plastic with a satin finish. They open easily allowing you to place almost any small collectible or personal item between the two flexible clear plastic membranes. Close the frame, place it on its stand that is provided and you have a neat way to show off your item from either side. The plastic membrane is flexible and tough enough to encase even dimensional objects including Fossils, Minerals, Coins and more. 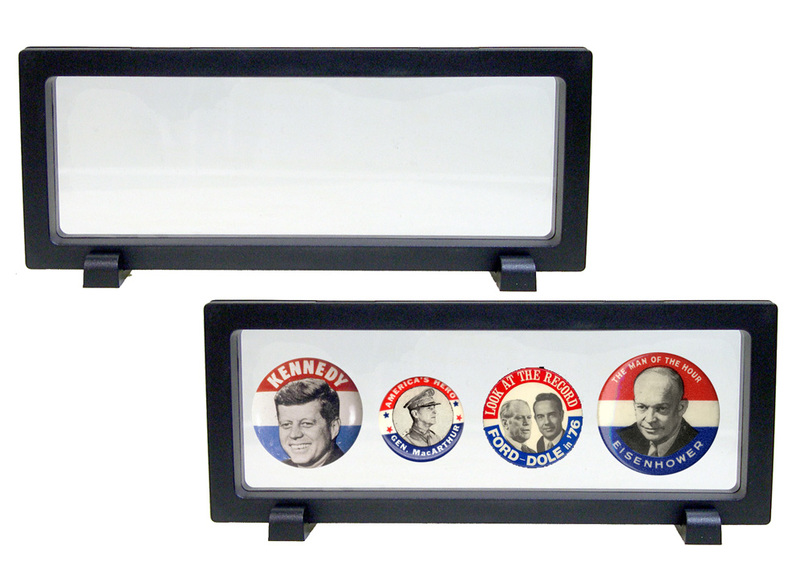 These Display Frames can also be used for collectibles, memorabilia and store displays. The plastic membrane provides an interesting “floating” effect to objects displayed. Clear Silicone Membrane seems to suspend displayed object in mid air. Frames have hinged top with snap closure. Display Frames include a separate display base that snaps onto frame. Display Frames are individually boxed. ITEMS IN FRAMES ARE NOT INCLUDED. SHOWN FOR DISPLAY PURPOSES ONLY. 3-D Display Frames seem to suspend display objects in mid air. 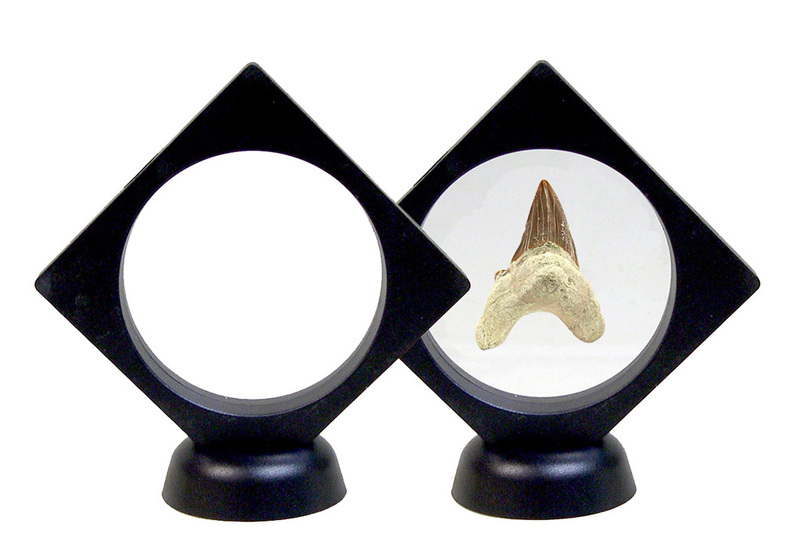 A) Diamond Shape Display Frame with Stand is 5" with 3" round window. Includes separate snap-on 2-1/8" round base. Satin black plastic & and clear, flexible display area. 3/4" Deep. 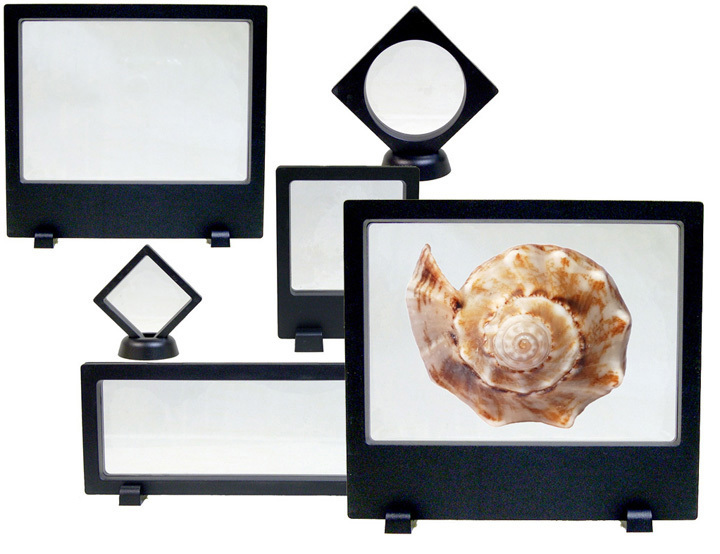 D) Rectangle Shape Display Frame with Legs is 9" x 3-5/8" with 8-1/4" x 2-5/8" window. Includes snap-on legs. Satin black plastic & and clear, flexible display area. 3/4" Deep. 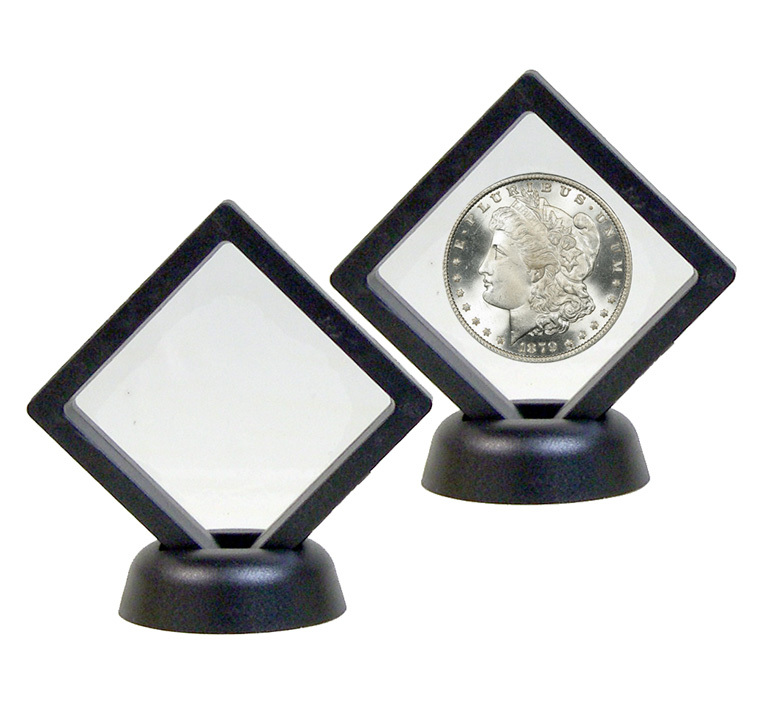 E) Diamond Shape Display Frame with Stand is 2-3/4" with 2-3/16" square window. Includes separate snap-on 2-1/8" round base. Satin black plastic & and clear, flexible display area. 3/4" Deep. 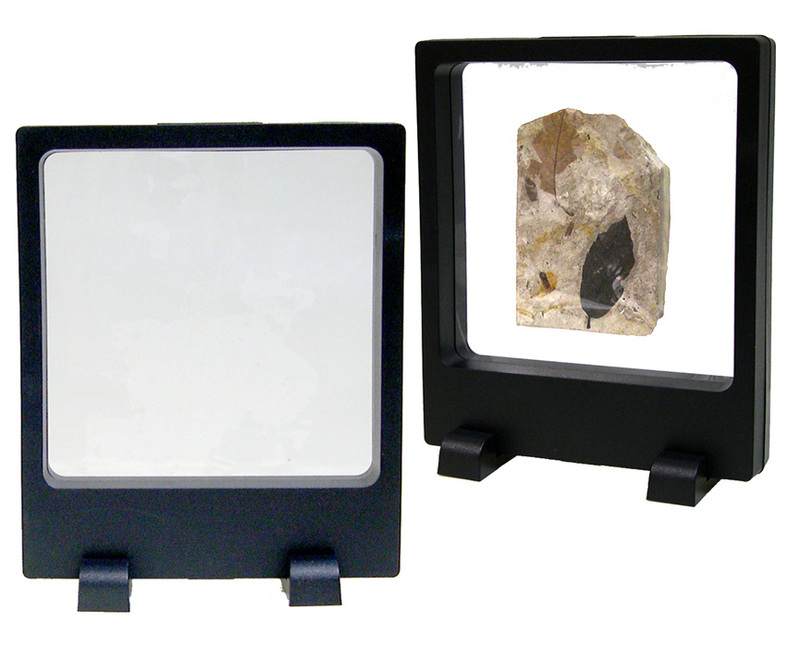 F) Diamond Shape Display Frame with Stand is 4-1/4" with 3-5/8" square window. Includes separate snap-on 2-1/8" round base. Satin black plastic & and clear, flexible display area. 3/4" deep. 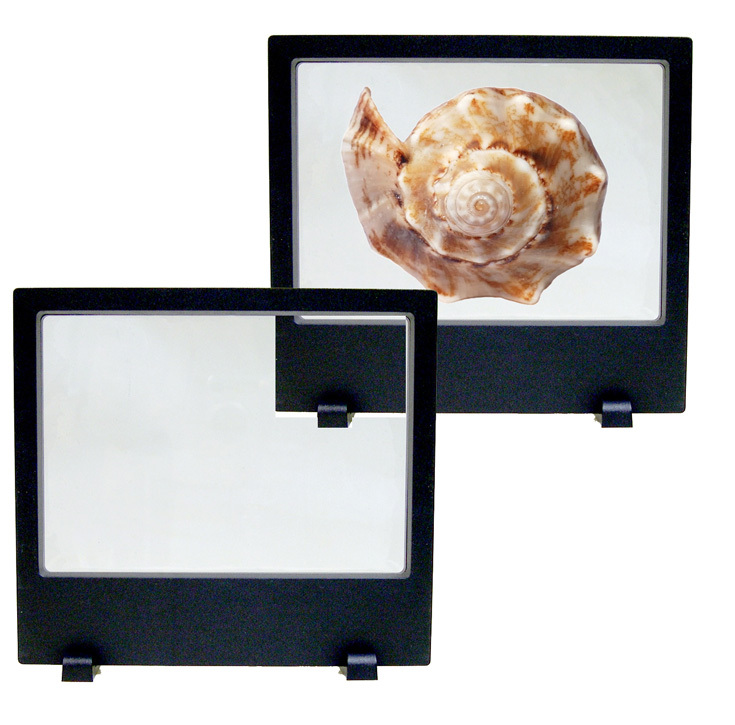 G) Rectangle Shape Display Frame with Legs is 7-3/4" x 4-7/8" with 7" x 4-7/8" window. Includes snap-on legs. Satin black plastic & and clear, flexible display area. 3/4" Deep.